Nothing stands in the way of our 2016 Honda TRX 250cc tiptronic quads when you’re tearing it up around our huge quad trek in Newcastle! These quad bikes will take you anywhere. 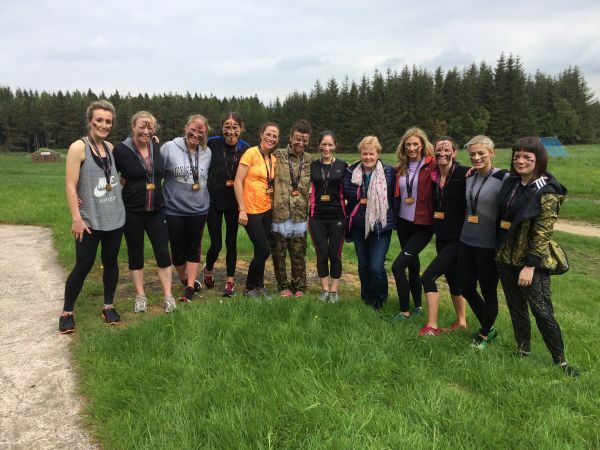 Bring your friends for an unforgettable quad bike ride as we head off into the Slaley countryside taking on enduro routes while under the watchful eye of one of our experienced Allout Adventures quad bike instructors. Add an Allout Action Camera for an additional £15 and record the footage of your exciting quad biking trek in high definition to show to your friends and family. 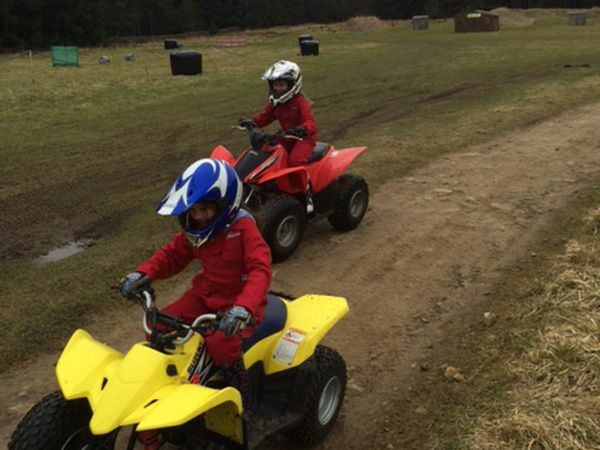 Bring the kids along for a quad bike session on our all-weather quad course which includes sweeping corners, long straights and even a bridge to ride over. Keep an eye on them alongside one of our experienced instructors as they have the perfect opportunity to show off on their way around the course. With Yamaha YFM 50cc quad bikes for ages 6-9 and Honda TRX 90cc quads for 10-15 year-olds we have the perfect range of quads for all ages. This fantastic Family Quad Trek experience is for everyone. Kids from 6-9 years will each be given one of our Yamaha YFM 50cc quad bikes and kids from 10-15 years will head out on our Honda TRX 90cc quads. Adult quad trekkers will follow behind on our Honda TRX 250cc tiptronic quads. 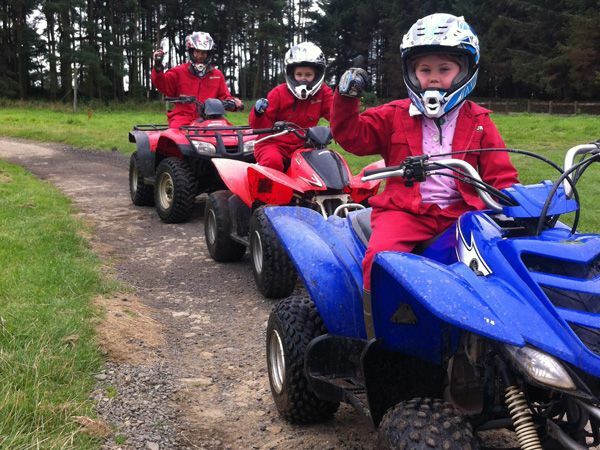 It's a great family quad experience led by one of our experienced Allout Adventures quad bike instructors around the Slaley Hall estate. Add an Allout Action Camera for an additional £15 per camera and record the footage of your exciting trek to show to your friends. Whether you're a beginner or a competent shooter, clay pigeon shooting is exciting for everyone. We offer packages of 30, 40 or 50 shots. We cater for up to 30 people per session. We can set our traps to as fast or slow, high or low as you can handle. We use plastic wad cartridges in order to instruct more accurately and improve your shooting throughout the session. Call us first to check availability. Take our specially modified 4×4 vehicle for a spin around our nationally acclaimed off road course. Kitted out with a 2.5 inch lift kit, snorkel and lightweight wheels you can negotiate your way around our course with one of our experienced Allout Adventures off road driving instructors. We'll instruct you on how to safely operate our amazing 4×4 vehicle off road as you climb steep hills, drop down sharp descents, blast through water canyons and over some amazing off camber sections that would tip any normal vehicle. No driving license but still want to come along? No problem at all. Passengers are welcome. 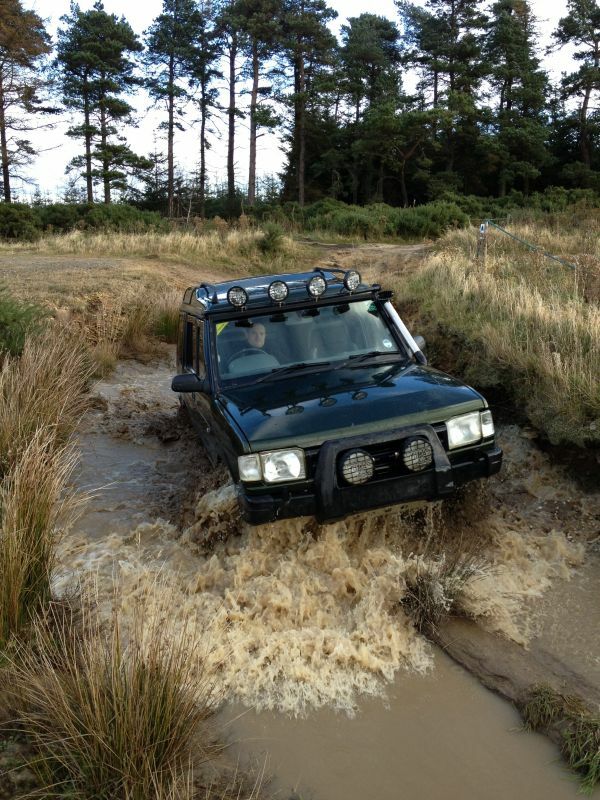 We offer a 4×4 demonstration if you'd like our instructor to take you round the course. See the 4×4 Demonstration section on our website. Try your hand at the ancient sport of archery. Aim for gold using our high velocity bows. Our instructors will give you a full lesson on how to safely carry out this activity. This can be turned into a very competitive activity by dividing into teams and scoring the most points. Gliding has a totally new meaning nowadays when you are hovering above the ground on our Segway Safari. These machines really do have to be seen to be believed and after just five minutes training from one of our experienced Segway Safari Instructors you will feel as one with the machine. 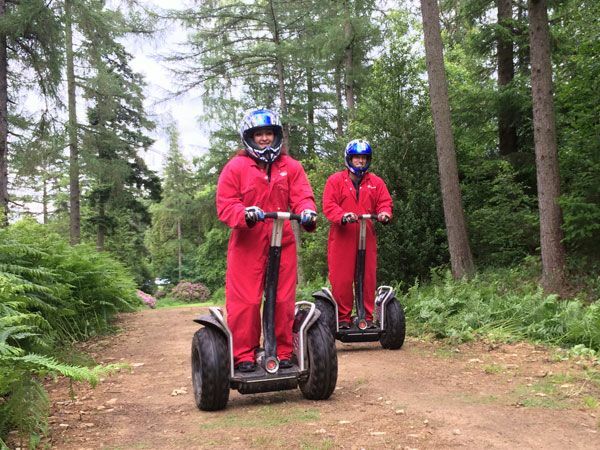 On your Segway Safari you will travel across the Slaley Hall estate roads, through the woodland trek and over open fields. You and your friends will glide effortlessly during your session. Add an Allout Action Camera for an additional £15 and record the footage of your exciting trek to show to your friends and family. Why not book onto our Segway Assault session where you and your group have a full safety brief and are then put to the test negotiating your way around the obstacle course on a skill challenge and then timed laps and even relay races too! 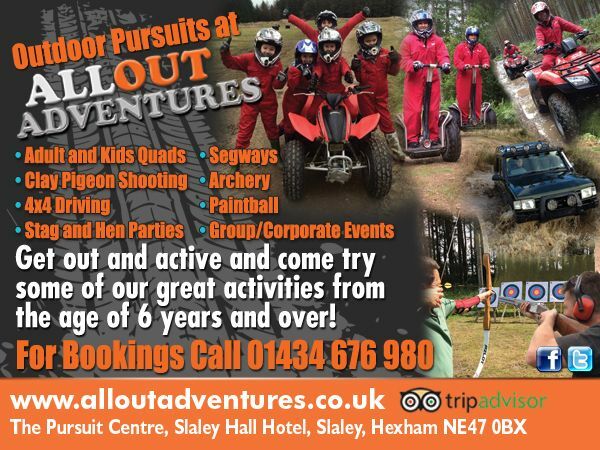 Please refer to our website at www.alloutadventures.co.uk or call us on 01434676980 for activity descriptions and restrictions or to make a booking. 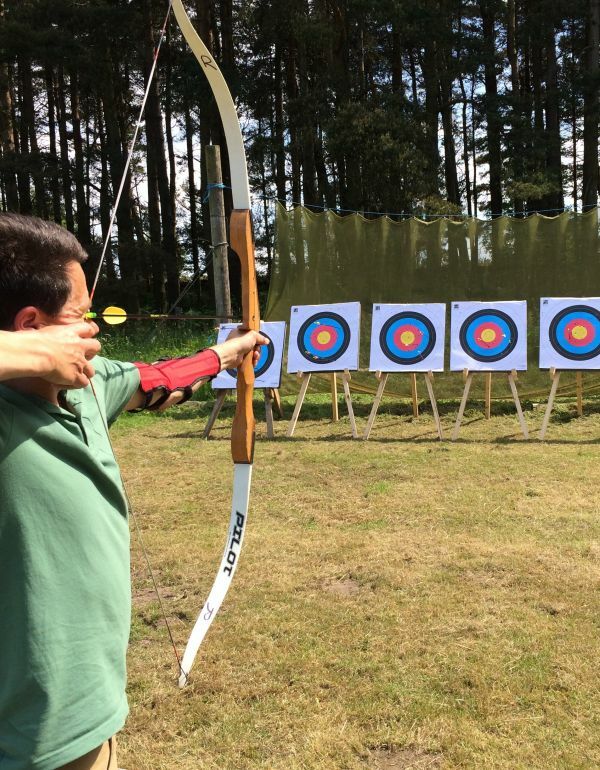 We came on a sunny Saturday afternoon and picked the awe throwing, archery, air rifle and paint ball package. It was really well organised, lots of fun and the staff were engaging and really helpful, would highly recommend. 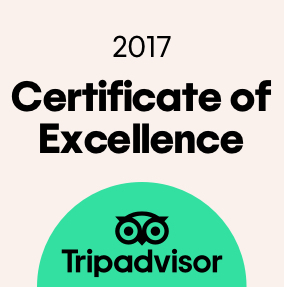 My wife and I have just had a fantastic quad bike experience with instructor Ian. Excellent instruction and tuition all provided without being too heavy and boring. Equipment, including overalls, boots, gloves and helmet all provided. Amazing varied route through forest and fields lasted about an hour. Our session was held after a recent rainy spell and was all the better for it, lot of mud and puddles, great. Definitely recommended. Thanks for an excellent time. Genuine Off Roading for beginners. We were a party of seven; two families with children between 10 and 15. I'd booked three children and two dads on a family quad bike adventure (hour and a half), and two mums on a landrover off-road driving adventure (an hour shared between two drivers). We rocked up in plenty of time for our slots and were greeted by big smiles, affability and a bit of cheeky banter. What lovely people! Organisation is very slick in the most positive sense. The equipment was clean and obviously well maintained. 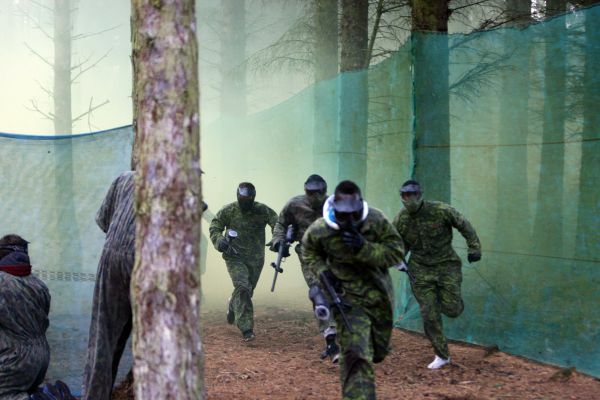 We were issued with coveralls, a balaclava and gloves each. All obviously freshly laundered. Then the helmets.......and I dread the helmets.......you know what I mean, putting a helmet on and you get the whiff of somone elses quiff. FEAR NOT! I don't know how they manage it but there was no hint of some other's bad hair day. If for no other reason, this warrants al 11 out of 10. No one in our party had really been on a quad bike or off roader before, but this was just absorbed into AlloutAdventures stride. Instruction and safety briefings were comprehensive enough to put everyone sufficiently at ease to continue and off we went. Our first ten minutes or so was really quite tame and gave everyone time to gain confidence. The rest of our sessions got progressively more adventurous across rocky terrain, rutted forest tracks and mud wallows. Not to mention open grassland that allowed a bit more open throttle. Our guides stopped to allow a rest and photo opportunities often enough, but not so intrusive as to get in the way of activity. The Girls arrived back from their driving adventure moments before we returned on our quad bikes, with glowingly positive reports that adrenaline IS brown. Got to hand it to the Allout Adventures team; a very smooth operation very professionally run. If I had to find any negatives at all (and I'm really struggling to find any), payment in full at the time of booking could be a bit harsh if you book months in advance, rather than a non-refundable deposit. And it was only once we were astride our quad bikes that we were informed of a requirement to acknowledge and sign a collision damage waiver for the senior quad bikes. If I'd been offered an insurance for a couple of quid to cover potential damages, I think I'd have opted to pay it. Thanks Allout Adventure. Great job well done.